In this story, Phil Gruber, news editor at Lancaster Farming, reports on the financial viability and ecological benefits of stream buffers on agricultural lands. Calvin Ernst, our founder and president, is quoted from a presentation he gave at a stream buffer conference in November. You can view the original story on the Lancaster Farming website here. Planting trees, shrubs and grasses along a stream can do more than beautify marginal land. Farmers can use the stream buffers to make money while helping the environment. “There’s a real need to get buffers on the ground in Pennsylvania,” said Steph Herbstritt, a Penn State doctoral student. But Herbstritt, who grew up on a farm in Bellefonte, has found that farmers aren’t as excited about buffers as she is as an academic. So she has set out to demonstrate the financial and agronomic advantages of buffers in hopes of making some converts. Buffers themselves are not new. USDA has been paying farmers for years to convert streamside farmland to forest as a way to trap nutrient runoff. But in 2016, under pressure to speed up water conservation work in the Chesapeake Bay watershed, Pennsylvania launched its own program. The state is encouraging farmers to plant buffers with the intention of harvesting crops from the land. Berries, nuts, sprigs for flower arrangements, and biofuel crops like willow are supposed to cover 95,000 new acres — an area larger than the city of Philadelphia — by 2025. “It’s not just a preservation system where we take land out of production,” said Tom Richard, Herbstritt’s adviser. Trees appear to make the most sense in the zone closest to the stream. They provide leaf litter and insects that feed aquatic life, and they shade the stream from the sun’s heat. But the trees themselves may not be enough to fight pollution. Over years of collecting nutrient runoff from crop fields uphill, a buffer can reach its holding capacity for phosphorus, which is often bonded to soil particles. “A buffer can only hold so much sediment before it lets go,” Herbstritt said. That’s why she and her colleagues recommend a strip of perennial grass be planted between the forest and the annual crop field. Harvesting the grass gets phosphorus out of the buffer, and the perennial plants put down deep roots in the soil, Herbstritt said. As an added bonus, a forest buffer could actually be more profitable than row crops on streamside land. River-bottom ground is often the most productive land on a farm — but that’s only if it doesn’t get flooded. If a farmer loses the crop in the floodplain one year in every three, the land probably won’t be profitable. “That’s not a big surprise when you say it, but it’s not the way we’ve been farming our landscapes,” said Richard, who is the director of the Penn State Institutes of Energy and the Environment. Suitable perennial crops might succeed, or at least not fail so badly, in the floodplain, he said. Encouraging farmers to plant buffers could also be a responsible way to use taxpayer dollars. It seems unwise for the government to subsidize crop insurance on flood-prone land while also funding conservation programs to clean up pollution caused in part by farming such risky ground, Richard said. And with flooding likely to become worse as the climate changes, making farms resilient only makes sense, Herbstritt said. There are some barriers to buffer adoption. Farmers may be overwhelmed by the paperwork required to get state buffer funding, and they will need to find markets for crops they haven’t grown before, said Veronika Vazhnik, a Penn State doctoral student. A decade ago, switchgrass looked like it might catch on as an ethanol feedstock, but those hopes faded as natural gas development made that fuel source cheaper, said Calvin Ernst, president of Ernst Conservation Seeds. Today, switchgrass is used as poultry and dairy bedding, an industrial absorbent, and silt sock filler, Ernst said at a buffer conference that Herbstritt and Vazhnik helped organize earlier this month. Buffers are versatile enough to fit large commodity farms, small niche operations and even places beyond farmland. 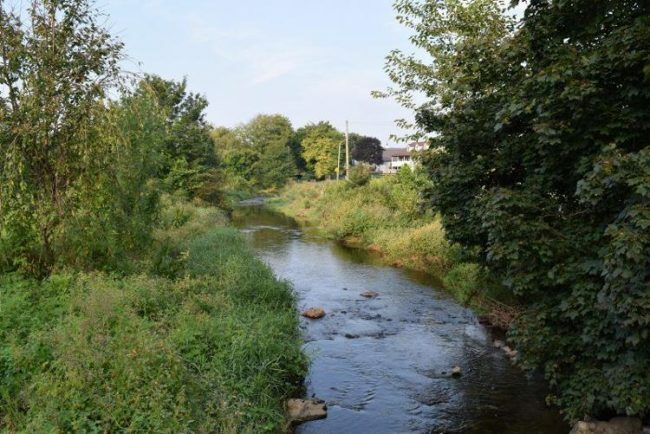 Stream banks next to commercial buildings and highways can benefit from buffers just as much as agricultural land can, Vazhnik said. One of the researchers’ goals right now is to normalize buffers, to show farmers that planting perennials next to streams is commonplace rather than daunting. “It’s something that your neighbors would not judge,” Vazhnik said. To that end, Herbstritt has planted two demonstration buffers covering about 6 acres in the State College area, and she has a third planned. “Tom (Richard) tells me I don’t need any more land,” she said. Anecdotal evidence from this oppressively rainy year is already helping her cause. The corn Herbstritt planted as a control at one of her sites looks like a total wash. The buffer plants? They’re still keeping on.